Multidisciplinary inpatient mental health (IMH) settings can be both challenging and rewarding environments to work in. The independent Commission on Acute Adult Psychiatric Care reported that most IMH staff were positive about their role despite the risks (e.g. within a year, 15 per cent of the staff had reported experiencing physical violence; 45 per cent had reported high levels of work-related stress; and a quarter had reported incidents of bullying). The report suggested that one of the main factors contributing to job satisfaction and quality care provision is a positive, collaborative and de-shaming ward environment. We explored this by providing a safe environment for team members to express and talk about their strengths as well as their challenges. We adapted a narrative therapy technique from Ncazelo Ncube, a child psychologist from Zimbabwe, to develop the ‘Tree of Work-Life’. In this we were assisted by Dr Chantal Basson and Judy Rathbone of Healthy Young Minds, Royal Oldham Hospital. We have delivered the activity across three different IMH units in Atherleigh Park, Leigh. How did we grow a Tree of Work-Life? We randomly allocated staff into groups and invited them to draw individual trees and reflect on the different parts of the tree that represented aspects of their journey to their current job role: the values and the people that influenced their career choices (the roots); their strengths and skills (the trunk); their hopes for the future in terms of their work (the branches); their contributions to the team (the fruits); the things that team members have given them that they valued (the leaves); and their current context (the ground). Each person was then asked to share their tree within their groups. Then, on separate paper leaves, they wrote the things that each person in their group had done or said that they appreciated. They exchanged these leaves as ‘gifts’ to each other. 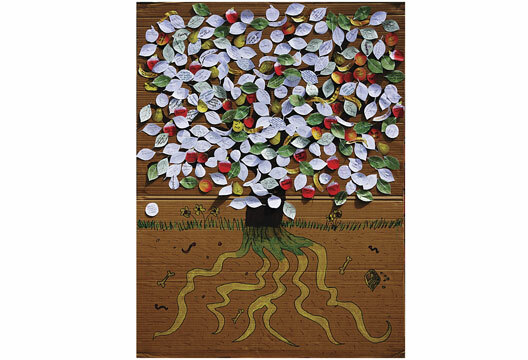 Each person then wrote their own contributions on separate paper fruits and stuck all the fruits and leaves on a collective Team Tree. They were then asked to reflect on the collective Tree and re-visit their values and hopes from this perspective. Finally, the groups were invited to discuss current challenges to their Trees (the storm). The activity lasted two hours (including a tea break prior to the collective Tree discussion). Inevitably there are considerations in setting up such an activity. How should we facilitate self-disclosure in a safe and reflective manner, considering boundaries, peer pressure and confidentiality? How do we address power imbalances, to ensure collaboration and sharing? How can we remain focused on strengthening team relationships and identities, rather than on problem-saturated stories? Can we deal with any risk-averse attitudes that can close communication channels, and minimise aspirations and hopes? Participants found the activity an ‘intimate exercise in a positive and professional way’, and one that ‘brought the team closer together’. Nevertheless, for some people the process felt ‘too long and personal’. For us, this was a moving experience that enabled us to be part of the staff’s exploration of their own roots. It felt rewarding to give staff personal feedback on their value, and it was enriching as a full-team experience.